Crassula falcata has been one of my favorites for a long time, both for the brilliant red Summer flowers and for the eccentric flattened gray leaves. Crassula falcata grows to 18" to 2 feet tall and slowly spreads 2 to 3 feet wide. Crassula falcata grows in full sun or shade and is quite drought tolerant. The stems will start to root if they touch the ground. Even broken off bits will often root. 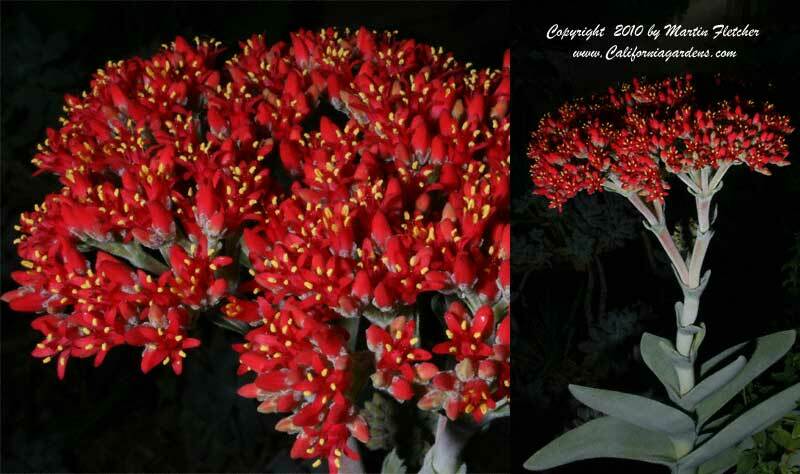 Crassula falcata is Winter hardy into the low 20°s but melted at 18° F. Hummingbirds stop by to check the red fowers out. Crassula falcata is a great plant for the Hummingbird Garden. Flowers and foliage of Crassula falcata - Airplane Plant. High resolution photos are part of our garden image collection.